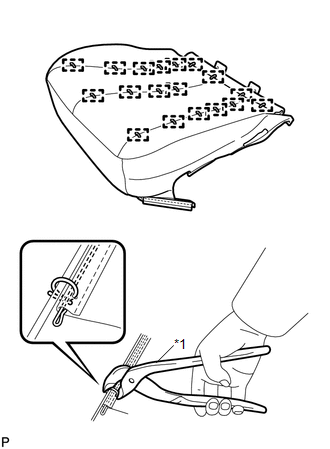 (a) Using a tacker, install the separate type front seat cushion heater to the end of the separate type front seat cushion cover with 25 new tack pins. Be careful not to damage the cushion. (b) Using hog ring pliers, temporarily install the separate type front seat cover with 18 new hog rings. Be careful not to damage the separate type front seat cover. 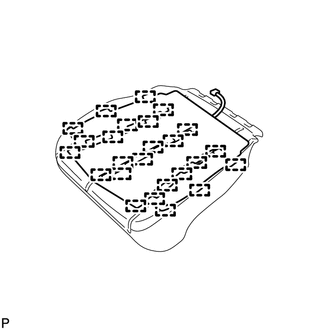 Be sure to securely install the hog rings as shown in the illustration while preventing wrinkles from forming on the separate type front seat cover.